There are three methods in which to open a price chart in MetaTrader 4 (MT4). Each method is explained below. 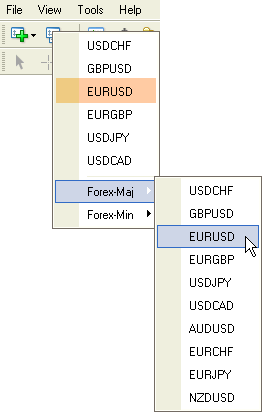 The most common method for opening a chart in MetaTrader 4 uses the File menu of MT4. Click on File and then click on the New Chart tab. Click the instrument for which you want to have a chart. Move your mouse over the File tab and Left-Click. Move your mouse over New Chart and Left-Click. 3. Move your mouse to Forex major/Forex minor to get a new list with all assets available for trading and Left-Click on the one you want. 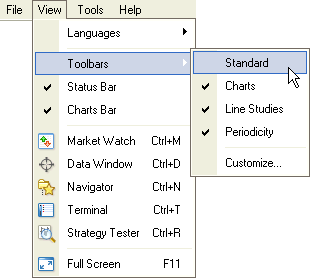 If the Standard Toolbar (shown below) is not visible initially, you need to open it. Left-Click on View on the top menu. Move your mouse over Toolbars and Left-Click on Standard.